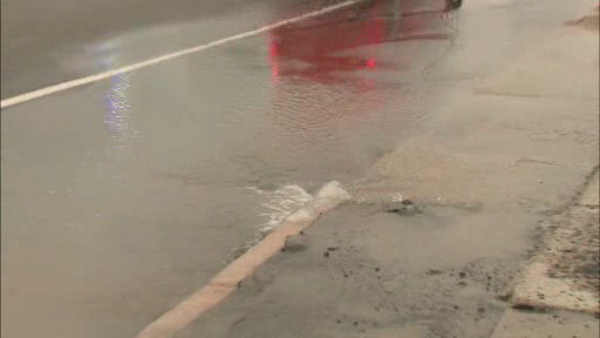 ELIZABETH, New Jersey (WABC) -- Crews responded to a series of water main breaks early Tuesday morning that caused traffic disruptions in Elizabeth, New Jersey. A spokesperson for New Jersey American Water says there were 7 or 8 breaks, all in the same area, starting just after 4:30 a.m.
All the breaks were relatively small, but water workers were trying to figure out why all the mains broke at around the same time. One main broke along Routes 1 & 9, sending water flowing down the shoulder. Two northbound lanes were closed near Olive Street for workers. NJ American Water spokesperson Peter Eschbach said the greatest impact is on Spring Street, where there are 3 breaks next to each other. The company hopes to have repairs made by the afternoon rush hour.